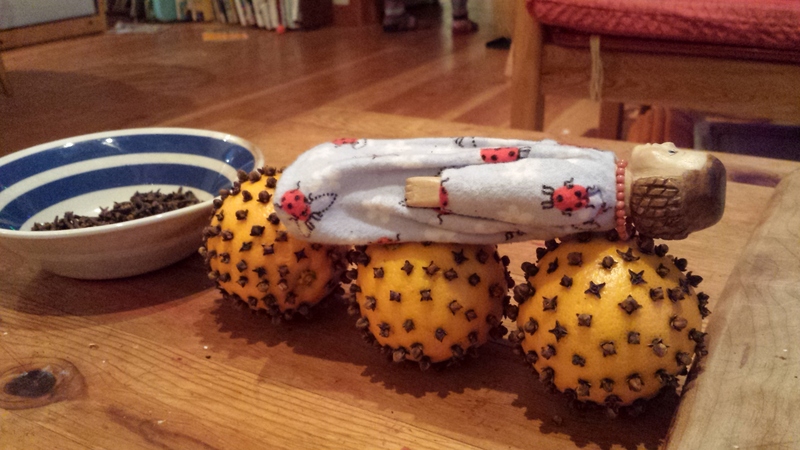 A couple of Hittys are visiting the smallest human’s home and family. 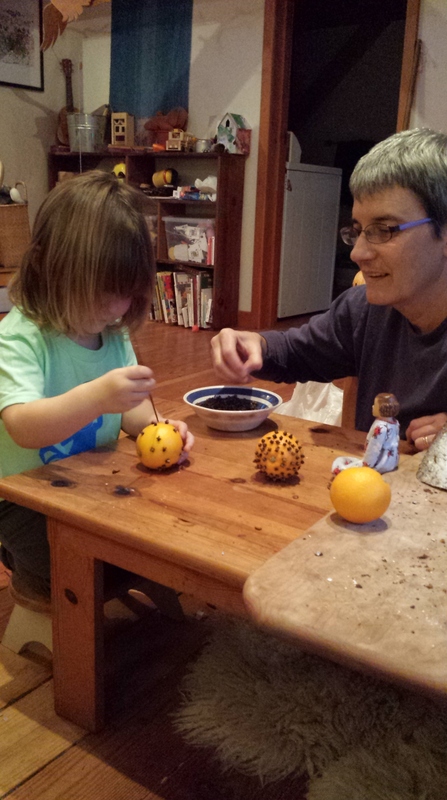 The afternoon included a lovely stint of cooperation while young and older humans made clove-studded orange pomander balls, with Dulcie looking on approvingly. Dulcie likes to wear her flannelette nightgown, which was lucky because after the balls were done, the small human put her to bed on top of them, stating emphatically that her bed smells SO nice! Hmmm, I can almost smell those sweet tangy scents! So cool that the generations are filling the gap with Hitty play. I am glad to play with little wooden and human people! I’m sure that Dulcie will have sweet dreams, thanks to the cloves, and that your granddaughter will cherish these precious times together- Merry Christmas! After the clove extravaganza, we all decorated their little tree! Small humans can be very thoughtful and caring! I agree – if we pay attention to very little people we might learn something! It was lovely to fleetingly visit the family, and share in a little bit of the Christmas fun, and Dulcie always likes to visit her little human!